As expected, without roosters our hens stopped coming home to the coop at night and started roosting in the woods. I never really gave the name "rooster" much thought, but it's pretty clear that they have an important job to fill on a free range chicken farm - they tell the hens where to roost and without them it is fowl chaos. Crowing and spurring aside, a rooster's value on our farm has gone up expotentially. In order to reclaim our hens, Scott and I made two evening forays into the woods to capture the missing birds. Scott read somewhere that once a hen has fallen asleep, it is easy to pluck them off their roost. Sure enough, this was correct. On the first night Scott walked right up to two hens, snatched them from the shrubs they were roosting in (at about waist level) and took them back to the coop. We weren't able to locate two of the missing hens (4 of our 8 were easily chased back into the coop), so the next evening Scott watched carefully to see where the jailbirds planned to roost. One choose a rather high spot in a tree, and the other (who'd been badly injured by one of our roosters) actually choose a pile of sticks near the ground. We went after the injured bird first and captured her easily. After applying a bit of neosporin to the side of her face (where the rooster had pecked her unmercifully) we stuck her in the coop and went off after the chicken in the tree. She proved to be too sly for us. She was so high that I had to pull a limb down to get Scott close enough to touch her and that wasn't close enough. She eventually woke up, flew off and obsconded as we tried to figure out a way to get to her. No worries though, the next morning I found her snooping around the coop, opened the door just a bit and she went right in. I guess two nights in the woods alone were quite enough. All eight surviving hens are now miserable, but alive in our coop. It is obvious that they very much want to free range and have retaliated by reducing egg production by more than half. We used to get an egg or so per chicken, per day. Yesterday Scott only found 3 eggs and that was two days worth. So now we are thinking chicken tractor. We never understood why so many free range chicken farmers had these. Our hens free ranged, roosted at home and gave us plenty of eggs without a mobile chicken house, but now we understand. Without a rooster around, a chicken tractor is the only way to let hens free range without the worry that they'll be eaten by predators or go feral in the woods. We'll let you know how it goes. We had two roosters. Now we have none. Life on a farm can be fun. It can also be really unpleasant. 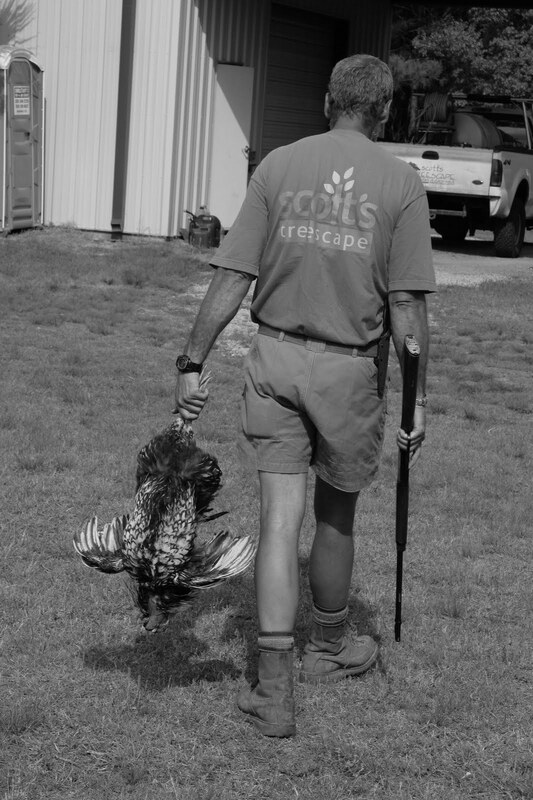 When we first got our Wyandotte chickens, we culled down to two roosters and waited to see who would reign supreme. The smaller of the two (Spot) appeared to be the better provider and protector, but Dinner (we were supposed to eat him) was far prettier and had a better crow. Well, we got complacent and decided that having two roosters was fine. They fought a little, but eventually worked out a deal - Spot got 7 hens, Dinner got 4 - and they basically shared the same space without too much commotion....until this spring. Once the weather got warmer, rooster testosterone levels went haywire. One evening Scott and I watched Spot and Dinner fight for about an hour. It was more of a dance than a fight though. Each rooster would fluff its neck feathers, charge, then jump over or under the other. No blood was drawn (even though they both have large, sharp spurs) and it was kinda pretty. Well, as time went on the fights got more serious and blood was eventually shed - sometimes in copious quantities. We decided that one of them had to go, and Spot made the culling decision easy. Spot had always been aggressive toward us and the kids, but for the most part he'd been all charge and no spur. His bloody attacks on Dinner, however, made us rethink the possibilities, and (with an outdoor wedding coming up on the property) we decided Spot simply had to go. As Ruby said in Cold Mountain, "I hate a flogg'in rooster. Let's put him in a pot." This, however, may have been a mistake. At first things were sooo much better. No more peaking around the corner to see if Spot was waiting to charge. No more displays of fowl aggression on mankind. Everything seemed so peaceful...until we noticed that some of the hens looked rather abused. Apparently a few days after realizing that he was now supreme chicken, Dinner decided that it was time for Spot's girls to be his girls. They however declined to submit... so he got nasty. Yesterday I noticed a hen that looked really beat up, but she wouldn't let me get close enough to check her out. Then, later in the afternoon, I went in the coop to check for eggs and was amazed at the mess - feathers were everywhere. I opened one laying box and half the eggs were smashed, then I checked another and...uh oh...there was a dead body inside! I called Scott in to perform a detailed investigation. His diagnosis - Dinner had spurred the hen in the back until he had splayed her open - a brutal murder. We found two other hens that were injured in a similar manner, though still alive. Scott got the .22 and took care of Dinner. Seemed like the thing to do at the time, but in hindsight, this too may have been a bad idea. A good rooster will call the hens in at night, find food for them and alert them to danger. Last night the girls were still out after dark and the two injured ones never came in the coop at all. We hope the girls will come out of it, but 24 hours later they still seem a bit lost. I think they became dependent on the guys and may be easy pickings for predators without a rooster around. A good rooster is obviously a valuable thing. Scott called a friend who raises chickens and found out that rehabilitation might have been a possibility for Dinner. In the future he said to put the attacking rooster in a box (aka prison) for a few days, cut his spurs, let him out after a brief incarceration and see what happens. Apparently this occasionally fixes the aggression issue, but the success rate is low (hmm, that sounds about right), and we'll never know whether it would have worked on Dinner or not. The good news is that we have new chickens on the way and we're a little smarter now. June 1 we should receive some Partridge Rocks. We hope they will be good layers and will go broody at some point as well. The Wyandottes have shown no interest in being mothers, and we'd like to have some bitties of our own someday. We'll also cull down to one rooster as soon as possible. Two was one too many. We've never seen our year old plus boar (Bo Diddley) attempt to mount either of our sows, and that was beginning to worry us, but Bo obviously likes the ladies. Our sow Magnolia had 4 babies Saturday morning - 3 girls and 1 boy - and Scarlet, Magnolia's sister, had 7 boys on April 9th (see previous post). Apparently Bo works his magic at night, then lounges during the day. Magnolia's lot of 4 will be ready to go June 12th, and Scarlet's 7 boys can leave the farm as early as May 21st. All of Scarlet's boys look great, but one in particular is quite the specimen. If you're interested in any of our hogs, send an email to bluefieldacres@gmail.com or call 910-540-4475. "Tank" (the specimen) above on the right and Scarlet's 5 other boys below.